This week Quirky Boots is hosting a Jam Jar Collective which I am gladly taking part in as I seriously need ideas of what to do with my growing collection of Jars in my cupboard. I loved the excuse to get my big box of craft bits out and see what I could do. I wanted to keep it simple but decorative. I chose the photo of a very special lady named Betty who sadly passed away 9 years ago but still and will always have a special place in my heart. She lived a few doors down from my Nan in Kettering and I would always look forward to the days my Nan would look after me as it meant I got to go and visit Betty and her dog Trixie too. I have so many fond memories that I want to cherish and never forget, like on a friday afternoon Betty would let me make the Parsley Source to go with her fish dinner that night, a simple memory but full of feelings. I plan to write them down and pop them in the Jar along with her photo. It took me nearly 8 years to find a photo of Betty as nobody had one, so I want to keep this extra safe. I simply popped the photo inside. Used some of my favourite patterened paper, paper flowers and buttons. then using some ribbon I tied a heart charm around the top. Voila! If you want to take part pop along to Quirky Boots Blog and join in the Jam Jar Collective! Previous Sorry to say good bye! Next Love was in the air! 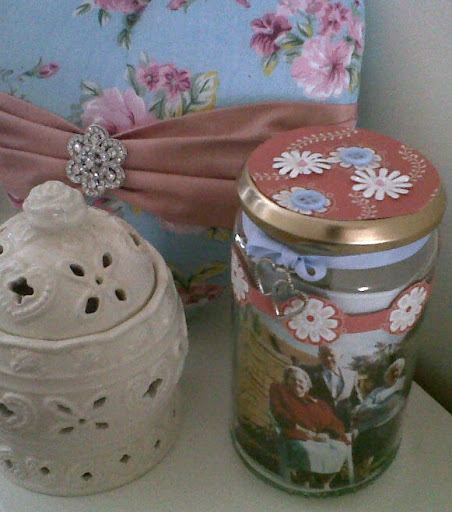 Lyndsey what a touching creation to use an ordinary every day Jam Jar for. I have stumbled across your blog through a RT on Twitter. I am a writer for quite a well known craft magazine and would really like to speak with you about using your idea. I shall email you now!